Summon: Master of Arms equips the two highest cost items from your discard pile. Master of Arms is an epic Intelligence creature card. It is part of the Core Set. "There's life in this old thing yet." "This might do in a pinch." "Come dance with a master!" "You are no match for me!" "Think you can take me?" 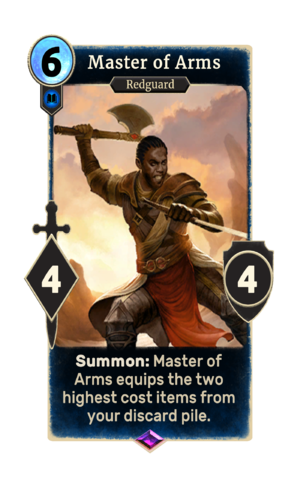 This card was previously part of the training mechanic where it could be upgraded from Student of Arms at level 34. An alternate-art version of the card was available in the 2017 New Life Festival Pack. While the normal art does not depict any specific items, the alternate art includes a Tome of Alteration and Mace of Encumbrance in the hands of the Master. This page was last modified on 14 February 2019, at 11:41.